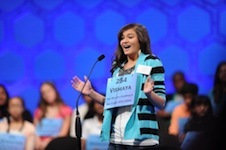 The annual National Spelling Bee near the Nation’s Capital is hosted by the E.W. Scripps Company. This is the second year at the new venue at the Gaylord Convention Center at National Harbor. Hundreds of kids compete from all around the nation. This interests local news TV stations and NBC NewsChannel assists affiliates by coverering the events and interviews participants as they progress through the competitive rounds. Again, Peter Roof helped in this coverage. This year we again used two Panasonic HPX500 cameras, one on the stage and the other shooting b-roll and interviews. Material was fed back to the Washington bureau via a new transmission method that uses mobile digital networks. The unit is made by “LiveU” and can connect on several channels to wireless networks and send live signals to the bureau. Because of the processing in the mode we used it took about half a minute for the signal to arrive but that suitable for this project.